A fully automatic control system for protection and signal output is available for easy central monitoring, making this pump convenient to control. 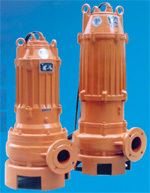 These pumps have excellent reliability, with functions of leakage monitoring, overheating protection and overload protection, etc. Speed: 740 - 2840 RPM. Discharge Dia. : 1-= - 24 inches (40 - 600 mm). Flow rate: 44 - 16,600 GPM (10 - 3750 m3/H). Head: 16 - 184 feet (5 - 56 m). Power: 2.0 - 335 HP (1.5 - 250 kW). Allowable solids dia. : approx. 1/3 of discharge dia. Start version: Direct-start or thyristor-soft-start.